Our favorite operating system Android has had a few years to grow and develop and the available applications have gradually adapted themselves too. Our current test candidate is one of those cases, where the existing review seemed to be no longer appropriate considering where the app is now. 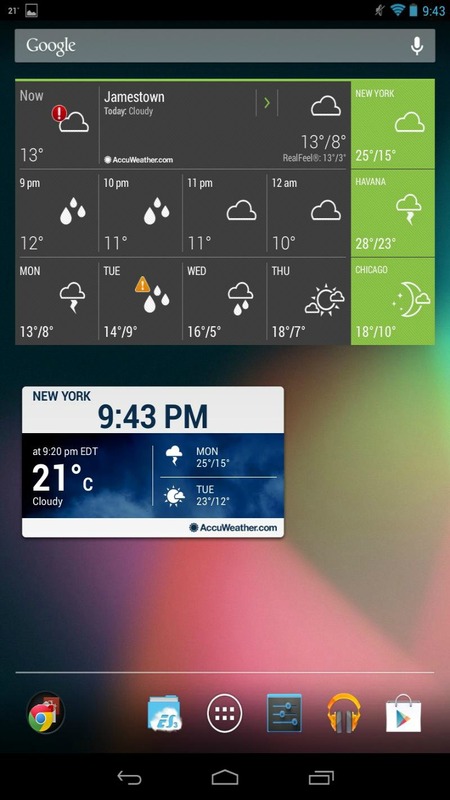 To find out more about how AccuWeather has grown and improved you can read all about it in today's review! When applications fail, it shouldn't be the end of their lives. If developers listen to the feedback there's every chance for an app to reinvent itself and become useful. And even well-made apps can progress and become even better. For this reason it seemed fair to review AccuWeather in light of the improvements and updates that have been made to it recently. The quality of a weather service comes from two different aspects. Of course, the "supplier" of the weather data is decisive, but how that data is applied to your location can majorly affect the validity of the prediction. In the first aspect it should be clear that AccuWeather acts as its own "supplier" of the data and does not offer other choices. The second aspect eludes us in this test because to ensure an objective test one would have to make an extensive tour through the country in order to compare the measured data. In terms of the quality of the measurements, AccuWeather performed well, and in my personal tests, the predictions were absolutely sufficient. Especially in terms of "precipitation and volume." The functionality of the application in the last test was very well received and it has changed little in the last few months. Still, AccuWeather convinces even more now because they provide not only the mandatory data such as temperature and precipitation, but also other useful information including the UV index or the visibility on a particular day. The latter, for example, makes a handy addition for anyone planning on visiting a viewpoint or lookout. The forecast includes the current day overview but can also be accessed in the form of an hourly or daily sheet. Here, the weather changes are vividly reproduced in optional charts, which show at a glance whether you'll be needing a raincoat, winter jacket or tank top. The next notable feature includes the categories "Movies", "Cards" and "News". So you can get your forecasts in video form, in cards that help you understand the weather movements vividly – especially interesting for amateur meteorologists – or you can catch your weather in news snippets mostly focused on the U.S. domestic market. You can also adjust your personal settings using "My AccuWeather". This means you can set your own preferences as the basis of assessment for, say, the perfect running weather. One person may like to go jogging at a comfortable 15 degrees while another prefers 5 degrees. This adaptation to each user's own profile is a big step forward, but the number of lifestyle activities has now been reduced to only 6 areas. The warning for asthmatics is sorely missed here too, as this provided a real benefit. 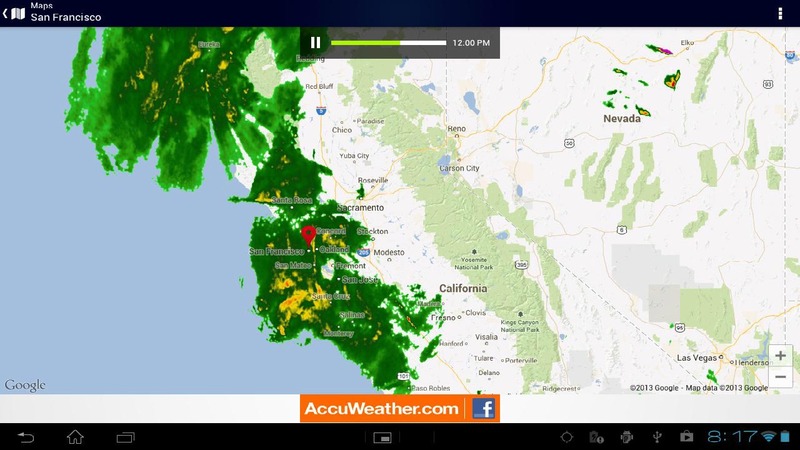 The developers behind AccuWeather seem to have something against going nowhere, hence the number of improvements and added levels of detail wherever you look in AccuWeather. However, some areas have been trimmed back unnecessarily in my opinion. With the comprehensive "lifestyle predictions" the current app version contains, there is some nice information no longer available and the lack of information for asthmatics tarnishes somewhat the otherwise very good overall picture. 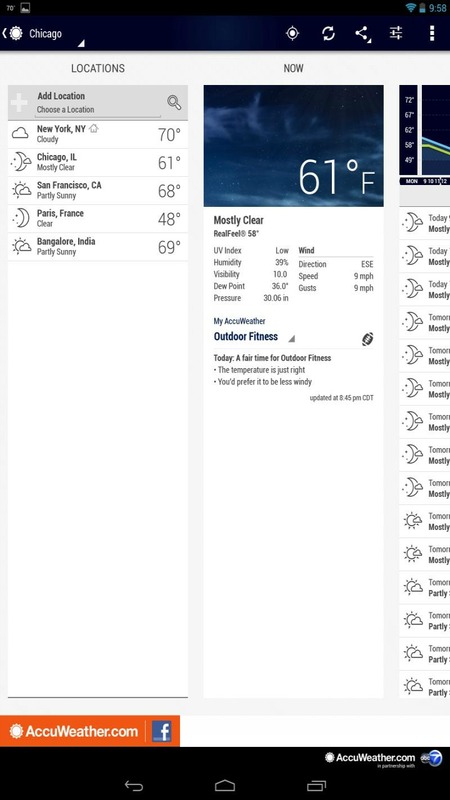 In terms of functionality, AccuWeather keeps the standards set by the last test report. The really interesting area is found, however, in the graphical presentations, which have improved greatly since the last version. 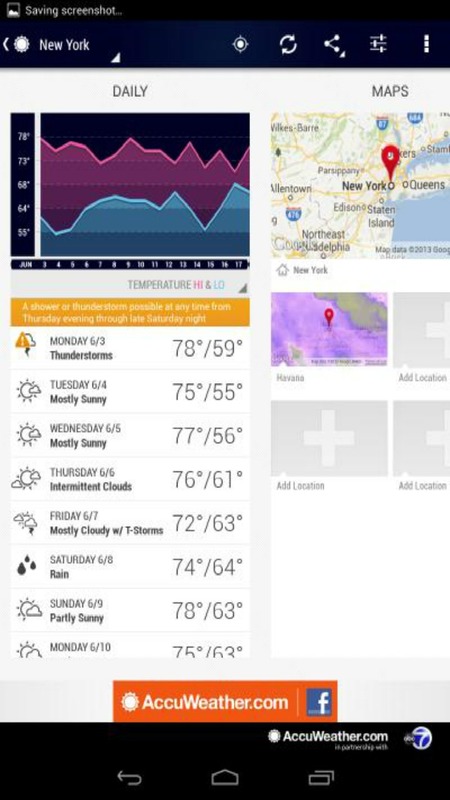 The makers of AccuWeather seem to have taken the various criticisms and feedback on board and have managed to get the application back on track. The design of the whole app fits very well into the overall picture of the operating system. Unfortunately though, sometimes the application does not respond to swiping gestures and the user is then forced to go through the control bar categories. At the end of the day, AccuWeather seems to only be lacking a new "pull-in" feature (which is always available in the other new app updates to grab everyone's attention). Considering the improvements that have been made, it would make sense to include something like this to draw older users back to the weather app who may not have been impressed with their first experience of it. AccuWeather ran the test period largely stable on the Nexus 4. Only once was a crash recorded. Unfortunately, the application sometime takes a while to load information. This is disappointing, especially for mobile use. 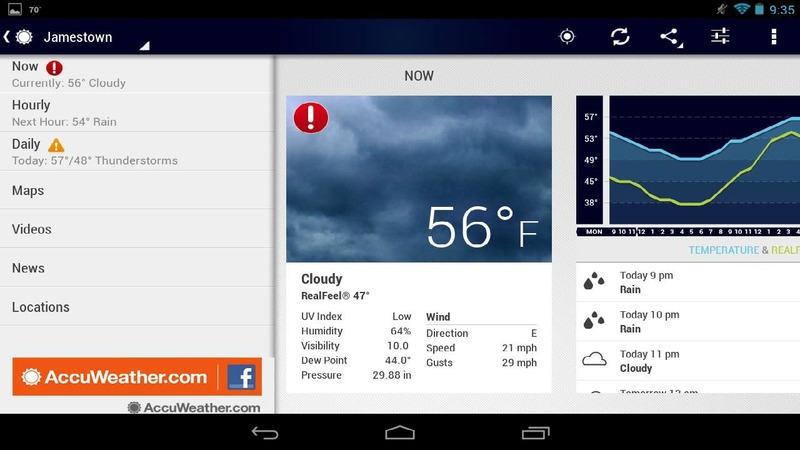 AccuWeather is free in the Play Store and is well worth checking out again, if you haven't already. The ad-free version can be purchased for 3 USD. And that's what happened: I looked at the weather forecast and decided to wash the car. Soon after, the rain came. I washed the car for nothing. Now I have to wash it again. I'm running a Galaxy S4 and the GPS works great. Perhaps they have a bug, but it hangs searching for my location. It just sits on the blue screen with the spinning circle. Hi Mark, that's strange that it's so slow? I use Accuweather and it's fine. I also use Weatherbug because I like to have two opinions! Shame they rarely agree though! Unfortunately, the app is so slow picking up your location and loading that it is not useful. Try Arcus instead.